Just north of the Arctic Circle in southwest Greenland is a spot at the end of a rugged tundra road where one can step directly off the edge of the earth as most of us know it, and onto the Greenland ice sheet. In summer, hike out a few miles into the jagged, rising surface, and you will hear only wind, the gurgle of running meltwater, and the occasional boom of an ice mass fracturing underfoot somewhere nearby. Amid the 24-hour daylight and seasonal warmth, the ice is rotting. Water ripples in pools and flows through ephemeral streams. In places, the water may plunge and disappear into a moulin–a potentially deadly hole that resonates with the deep-throated thrum of an invisible under-ice river. 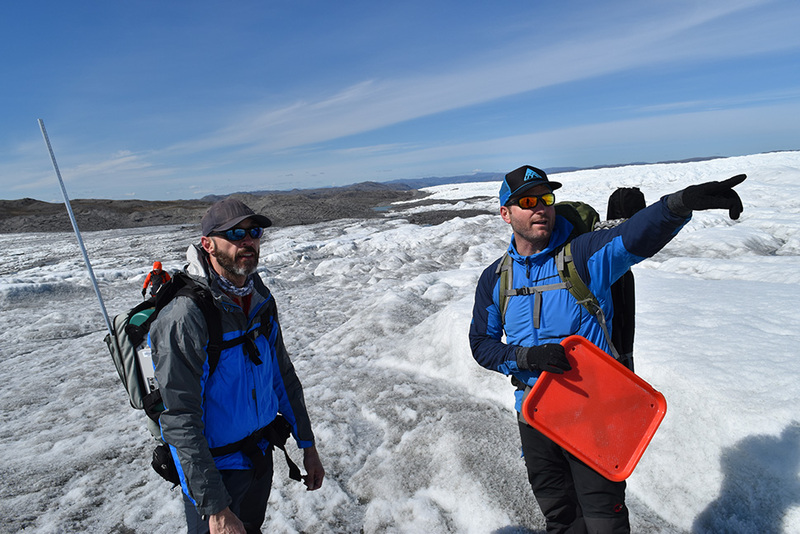 Glaciologist Marco Tedesco and a few colleagues walked here this July to study how warming climate is fueling the accelerating decline of the Greenland sheet–the second-largest ice mass on earth. Specifically, he was investigating cryoconites–curious little cylindrical melt holes filled with microorganisms and dust. Often no bigger than a fist, they are part of a much larger natural system that may be magnifying the human forces tearing at the ice. Behind him loomed 660,000 square miles of frozen water. At the edge, it might be only tens of feet thick; in the faraway interior, nearly two miles. If all of it were to melt, it would raise global sea levels about 20 feet. Most scientists think that if this comes to pass due to human-induced climate change, it will take centuries or millennia. But no one really knows. 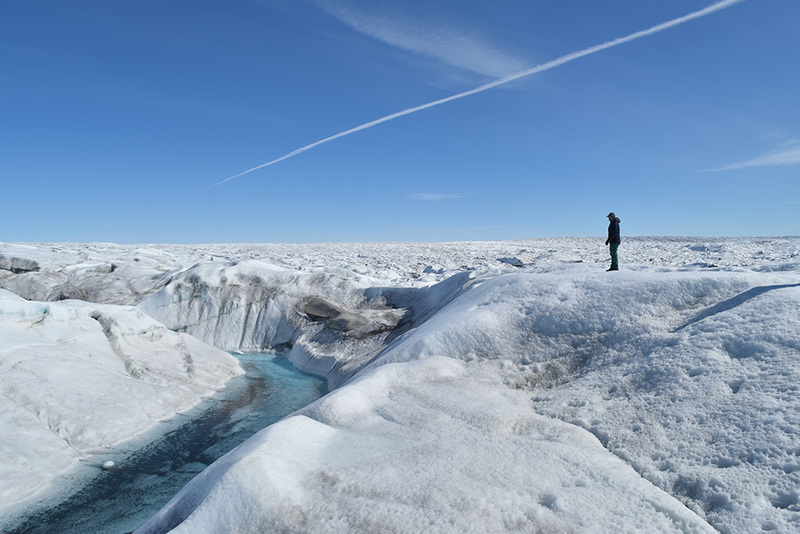 Some of Tedesco’s colleagues recently published geologic evidence that Greenland’s ice did in fact largely disappear some time in the last million years, during one or more past warm periods quite similar to our own. In any case, sea-level rise is already gnawing at coastal areas and islands around the world, and Greenland is partly responsible. Seasonal melting there has increased by about a third since 1970, in tandem with a 2.2-degree Fahrenheit increase in summer temperatures. It is now losing about 270 billion tons of ice each year. About 70 percent of this loss comes from meltwater runoff; the rest is caused by icebergs discharging directly into the ocean. In 2016, parts of Greenland saw a melt season 20 to 40 days longer than the 1979-2015 average. Largely as a result of this, between 1993 and 2014, yearly global sea-level rise accelerated from 2.2 millimeters to 3.3 millimeters. Most projections of 21st-century sea-level rise range around two to four feet–but these projections generally do not take into account the melting of Greenland, nor the even bigger mass of Antarctica, because the processes there are still too poorly understood. Considering those factors, some scientists say the rise could be up to 10 feet. That is why it is important to try and figure this out now, says Tedesco. Climate-related darkening of the ice may be one major factor helping drive the accelerating melt. Windblown dust from natural erosion and human pollution lands on the snowy, naturally reflective surface. In winter, snow covers this up. But because summers are hotter now, come each summer, the surface melts more quickly and extensively, exposing and distilling residue from previous years. Thus the summer surface is becoming progressively darkening. Darker surfaces absorb more solar radiation, so this leads to faster melting. This leads to more darkening. And so on. “It’s a vicious circle,” says Tedesco. And, it is only part of the circle. 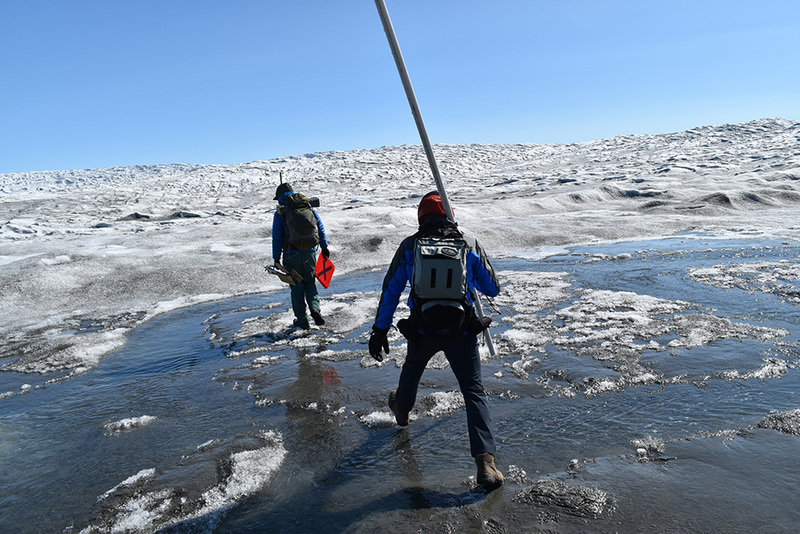 Hardy photosynthetic algae and other tiny organisms that specialize in growing within ice and meltwater are basking in the increased warmth, and also building up. To protect themselves from the sun, they develop dark pigments–and this darkens the ice even more. This may be adding greatly to the melting; in fact recent research suggests that such organisms may have now become the primary source of ice darkening. Scientists are only just beginning to appreciate this interplay of ice physics and ice biology. Cryoconites are hot spots of such activity. 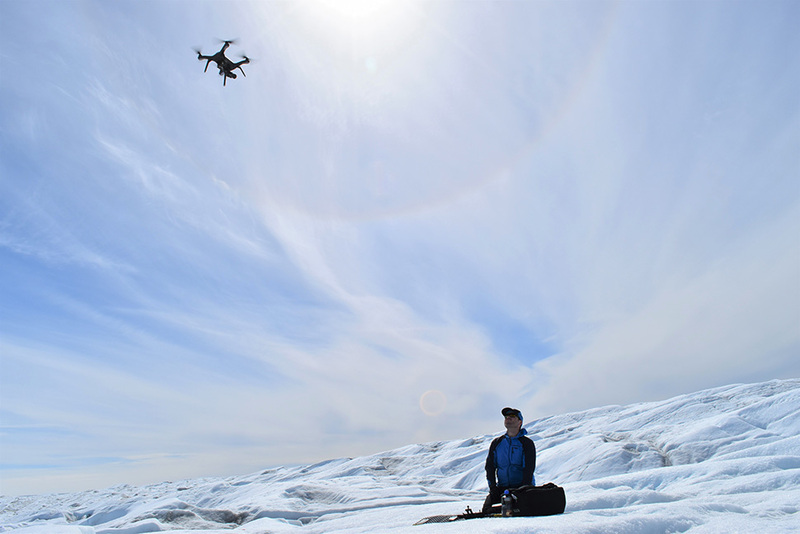 Tedesco’s trip began at Kangerlussuaq, a speck of a settlement built around an airstrip that links it to the outside world. In summer the town becomes a staging area for scientists, and for tourists willing to pay the steep cost of getting there for a glimpse of the far north. Here Tedesco hooked up with Matthew Cooper, a PhD. student at the University of California, Los Angeles, who studies the hydrology of the ice; Dan Bennett, a member of Lamont’s advisory board who had volunteered to come along; and myself. 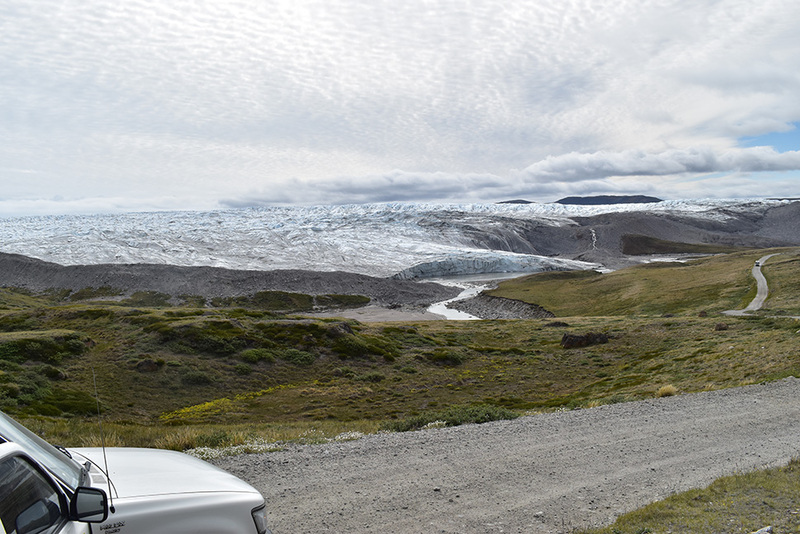 After a couple of days spent sorting out equipment and supplies, we headed out in a rented four-wheel drive pickup along Greenland’s longest road–a rough, 16-mile dirt ribbon following the Akuliarusiarsuup Kuua River, which drains a tongue of the ice sheet. On the way, Cooper told me that studies by his group have shown the river grows as summer progresses, and melting gathers speed; it also waxes and wanes daily as the sun rises higher in the sky during day and drops lower at night. 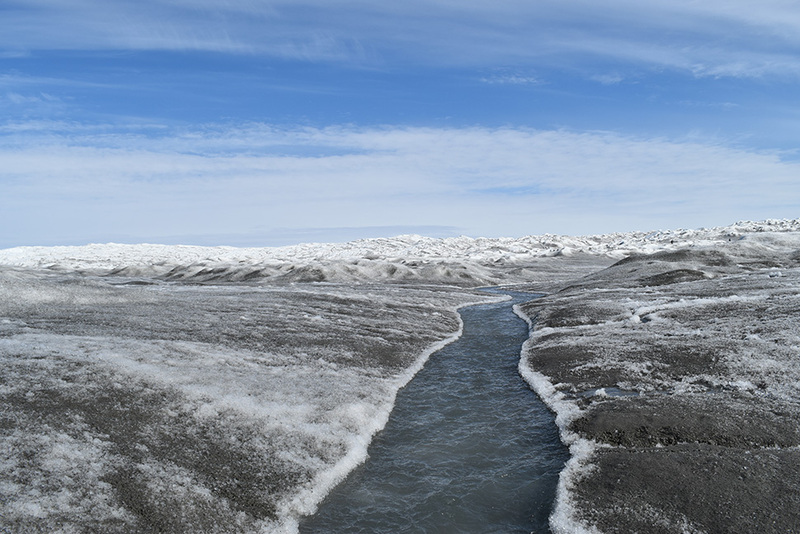 Near Kangerlussuaq–in Greenlandic, the name means Big Fjord–the river joins other melt streams, and the water flows out said big fjord to the ocean. In recent particularly warm weeks, it has washed out the few crude bridges around town–a real-time, hyperlocal effect of climate change. Before we even reached the ice, there were reminders that the climate is changing. The road wound through green tundra hills punctuated by raw rock outcrops. In one protected spot we passed a small patch scraggly spruce trees–unremarkable anywhere else, but practically unknown this far north, because it is, or was, too cold. Rumor had it that someone planted these as an experiment some years back. Now they were reaching skyward–not the only place in the Arctic where trees are poised to invade the tundra ecosystem. Tedesco and Cooper’s more immediate concern: polar bears. Normally they live on sea ice, hunting seals, but now the sea ice is melting too, and the 1,000-pound predators are moving onto land–even into the largely lifeless ice sheet, where they have never before been seen. Two had been spotted just weeks before at research stations deep in the ice.One menaced scientists for a day and half before it was shot and killed. We came armed only with pepper spray and air horns. At first, what appeared to be a low-lying cloud bank loomed on the horizon. This, Tedesco told me, was the Russell Glacier, an outlier of the ice. As we approached, the landscape became ever bigger and grander. Towering, heavily crevassed ice tongues lapped into the river valley’s sides. Creeks gushed out of them and into the river, which raged over rapids and waterfalls. The road dead-ended at a series of bare hills made of loose dirt and giant boulders–the Russell’s terminal moraine, where advancing ice had previously pushed on the earth like a giant plow. Now, with the glacier in retreat, the ice edge sat low on the other side of the moraine. We made camp nearby. Harried by mosquitoes and distracted by caribou galloping by, the scientists readied instruments and equipment to carry in. Next day, we hiked over the moraine and descended onto the ice. Here at the edge, it looked more like a dirt sheet than an ice sheet; mud and pebbles coated the crunchy, fast-melting surface. Much of this debris was probably blown off the moraine onto the ice. Jumping the first of dozens of shallow meltwater streams, we walked inward. The ice sloped up in fits and starts. The topography roughened, devolving into hummocks, gullies, hills, pinnacles, cracks, rivulets, puddles, pools and waterfalls. As we ascended, the surface became progressively whiter. It was cold, but the sun was blinding; without sunglasses and sunblock, we would have fried. After an hour or so, the land behind us was no longer visible. Cracks and meltwater ponds revealed ice that gleamed bright blue–a sign that it had been once deeply buried and heavily compressed, probably over thousands of years. Now the blue ice was exposed to the sun. At one crack, a modest meltwater stream suddenly disappeared into a hole, producing a distant low-frequency gargle. It was a small moulin. “Oooh, that’s creepy,” said Tedesco. “Stay away from that, guys.” Up ahead somewhere, we could hear the distant roar of a much larger one. We stopped at an irregular swale. 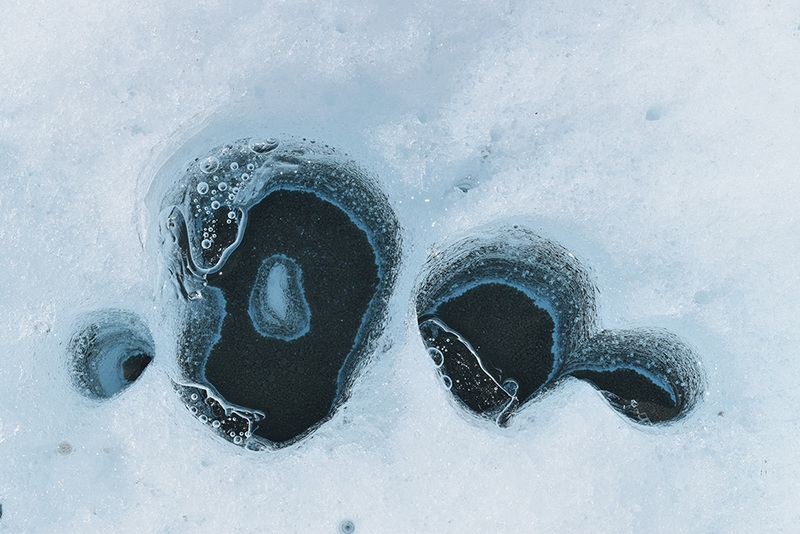 Here, the scientists spotted hundreds of circular holes drilled into blue ice. Cryoconites. Ranging from finger- to soccer ball-size, many were filled with crystal-clear meltwater. At the bottoms, a few inches or a foot down, lay a coat of dark ooze. Cooper and Tedesco set up shop here. Cryoconites exist in icy environments across the world. Biologists have shown the bottom ooze is an admixture of dust, soot and dozens of organisms. These may include photosynthetic algae, bacteria that feed off the dust itself, protozoa, yeasts, microscopic eight-legged rotifers, jellyfish-like tardigrades, and lots of viruses. In many of the cryoconites, small bubbles were forming at the bottoms and ballooning to the surface–methane and other gases produced by this metabolic stew, said Tedesco. He cautioned me not to fill my water bottle from the cryoconites. No one is exactly sure how they evolve, but somehow, dust and organisms concentrate in one spot. The organisms deposit their byproducts and dead bodies, eventually in enough quantity to form a slime that binds themselves and the dust into a muck that becomes increasingly coherent and efficient at attracting solar energy, melting out a little hole. Little holes become bigger holes. Holes may grow into each other, forming a pond. Liquid in a ponds tends to melt out its sides, and if this progresses outward to a low spot, this spot may become the headwaters of an erosive melt stream. Tedesco and Cooper had come equipped with sterile bottles, a big syringe and a long spoon to sample the cryoconites’ water and ooze for a biologist at Montana State University. Tedesco deposited a dollop of the ooze on the end of yardstick and offered it to me like a sample of fresh fudge. “Here, you have to feel it!” he said. I did, and it felt like fine, slippery swamp slime. From somewhere nearby came a muffled thunderclap within the ice–a slight adjustment, with no visible results. Everyone looked at each other, then went back to work. Tedesco had lugged up a heavy, breadbox-size spectrometer in a backpack. With Bennett holding a laptop to record data, he walked around pointing an attached sensor at the sky, then at the surface, to measure incoming light, and the amount and colors being reflected back. Such measurements are routinely made by satellites on a much larger scale. Comparing ground data with these should help researchers understand how to interpret the satellite imagery, and how small features like cryoconites feed into the overall picture. As a side project, Tedesco is in on a NASA effort to study Mars, where cryoconite-like features are thought to exist. Do they hold liquid water, like those on earth? Do they have living ecosystems? Comparing the light signatures of earthly cryoconites with Martian ones might help address these questions. Cooper, for his part, had carried up a small drone equipped with a camera. With a portable joystick setup, he launched the helicopter-like machine. It flew a series of grids over the study area with a sound like a giant hummingbird. The images would later be stitched together to make a highly detailed map of the area. As the evening sun dipped toward the horizon, we made our way back to camp, Tedesco lugging a now-loaded picnic cooler holding water and ooze samples. It was 8pm by the time we returned, and getting quite cold. A young caribou trotted by. After a quick dinner heated up on a portable stove, Tedesco and Cooper were up until midnight checking out their data and recharging batteries. 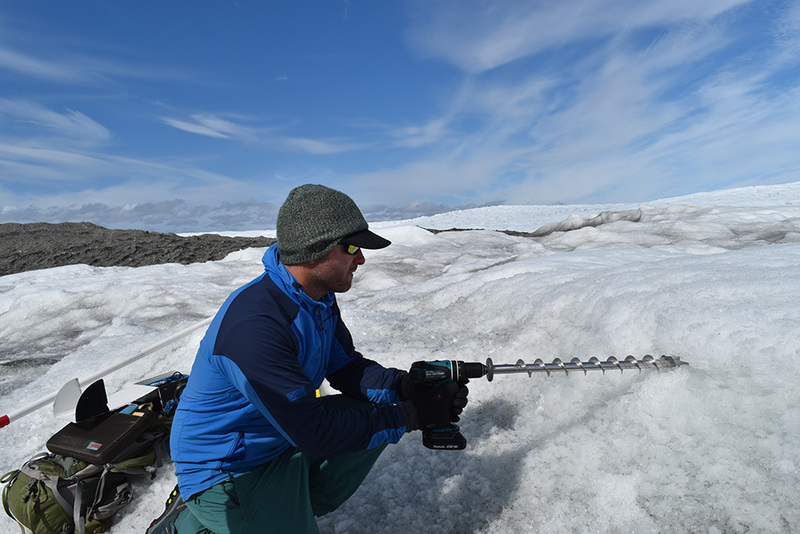 During the following few days, Cooper tested out an instrument to measure light penetration under the ice. One day, fog rolled in, and we did not venture out; too easy to get lost out there. Occasionally, a few hardy tourists showed up in rented vehicles. Most just stepped briefly onto the ice edge to take selfies, and turned around. On the final day of fieldwork, we hiked back to the initial study site. 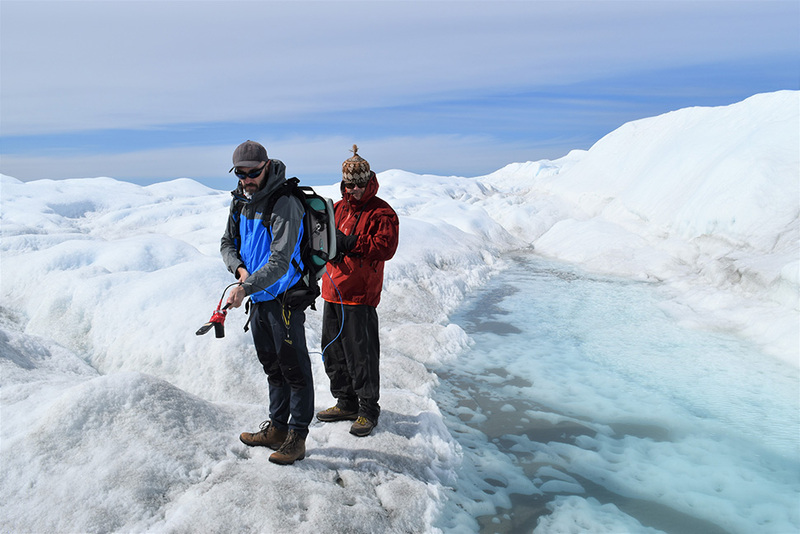 This time, Cooper and Tedesco lugged in a 10-foot pole and tripod in order to mount the spectrometer well above the ice. The apparatus was unwieldy, and it took them several hours to wrestle it into position in several spots. It was getting late, but we decided to do some extra scouting. Following the distant roar of water we had heard the first day, we hiked deeper into the ice. Past a series of ridges, we came upon a clear river running in a blue-ice canyon maybe a hundred feet deep. At one sharp bend, a whirlpool churned. Upstream, to our right, the river wended its way out of sight through a series of loops reminiscent of the Grand Canyon. To our left, it entered a snow-roofed tunnel and abruptly swirled down the lip of a giant, roaring hole. We knew enough not to get too close. It was time to stop doing science, and just stand back in fear, and awe. 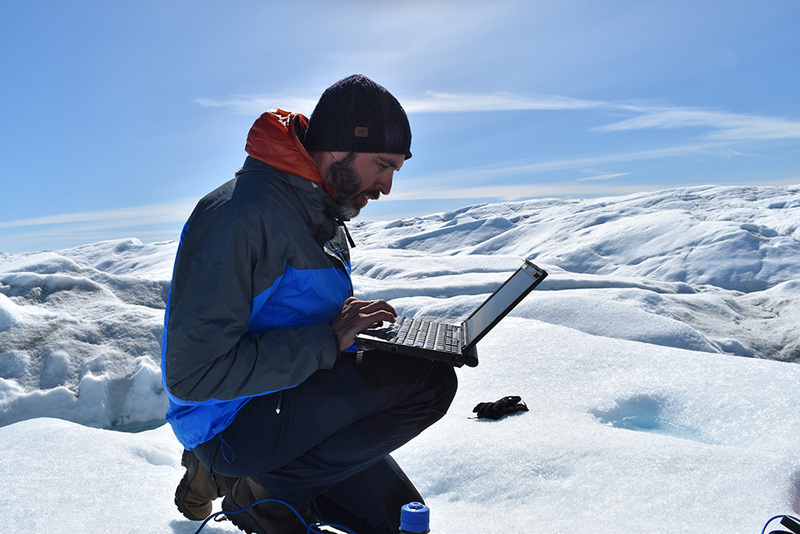 Read Tedesco’s Scientific American article on exobiology and the Greenland ice.